ALICE SPRINGS, Australia (WLS) -- Meet Roger the kangaroo, whose bulging muscles and mean stare made the Internet say "wow" this week. 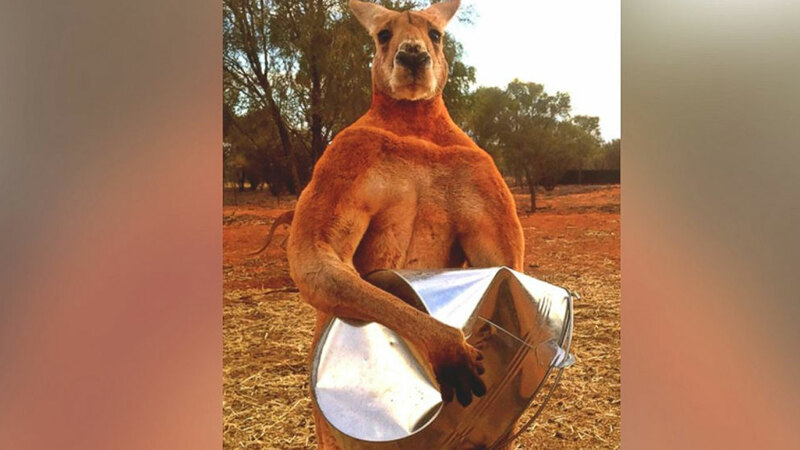 Roger went viral after his owner posted a photo of the massive kangaroo crushing his feed bucket after a meal. "Roger's favourite workout is crushing his metal feed bucket," wrote Chris "Brolga" Barns. "Better the bucket than me!" Roger lives at The Kangaroo Sanctuary in Alice Springs, Australia. Brolga found Roger in his dead mom's pouch along the side of a highway in 2006, and has been raising him ever since, according to ABC News. 25 kangaroos live at the sanctuary, though Roger's Internet fame has made him the chief attraction. Roger, now nine years old, stands an imposing 6' 7" and weighs 200 lbs. Brolga says Roger tries to kickbox him, but he's able to escape to safety. Brolga is hoping the new-found attention will help spike donations, enabling him to build a wildlife hospital on the reserve's 90-acre grounds. More information can be found at https://www.kangaroosanctuary.com.